Kauai is lush and beautiful, just like I knew it would be. 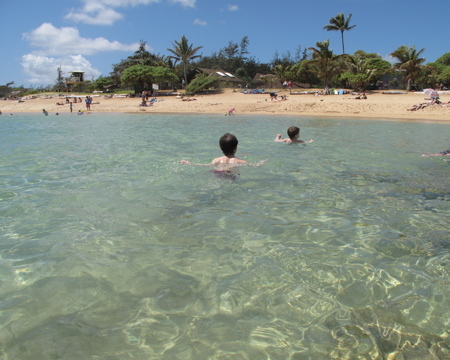 Here are my boys taking in the calm waters at Lydgate Beach State Park. And to continue myPriti Nail Polish exploration, here’s a shot of their Hula Girl Rose, a fun, hot pink. In reality, it’s much a much brighter, hotter pink than the photos show. I’ll try to post more photos soon. oh Trish….That looks so beautiful!!! so lucky!!! The conference I was attended is over and now I can just play!! Indeed! Very happy toes 😉 How was your trip to Maui? Was Hana as gorgeous as ever? Kauai reminds me a lot of Hana. Beautiful! Congratulations on your awesome trip! Pretty Polish too..perfect for the beach and sand. Beautiful photo! Looks amazing…love the polishes too! Kauai is amazing. 🙂 Thanks for reading!